Last Tuesday marked the return of Buffalo Tom. OK I know they've been playing there annual Paradise shows over the past few years, but they haven't released any new material in 9 years. So it's nice to be able to gush a little over a band I always felt deserved more acclaim. 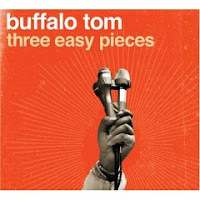 Three Easy Pieces finds the bands in top form with 13 stunning tracks. Clint Conley (Mission of Burma) and Chris Toppin (Fuzzy) guest on what can only be explained as the return of one of Boston's best bands. You can catch them at The Paradise tomorrow night.